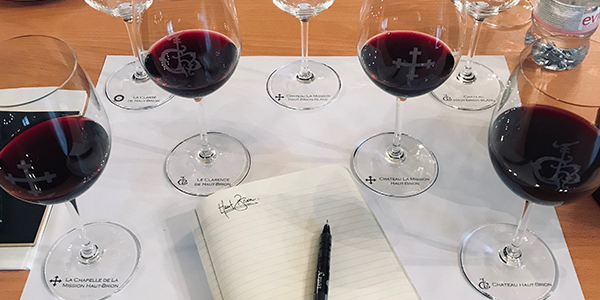 Blog » L&S Post » 2018 Bordeaux En Primeur: Delight Or Dismay? Bordeaux is the largest wine growing region in France so one should be naturally sceptical of attempts to generalise about conditions across its 111,000 hectares of vines. This is especially true of 2018, a vintage variously affected by downy mildew during a wet Spring and localised hail during May and July. Some crops were devastated by the hail, others managed their way through the mildew which left many organic and bio-dynamic producers in real trouble. Fortunately, the sun eventually came out and it didn’t stop shining for three glorious months in a long, hot summer reminiscent of 2010. The only blight was the heat, with some younger vines on porous soils vulnerable to drought. Conditions at harvest were ideal too, allowing most estates to pick with impunity. How dismal it must have been for the bystanders who lost fruit to hail and mildew. The short answer is we don’t know yet. Bordeaux winemaker and taster Gavin Quinney calls the wines ‘2016 plus, plus’. That sounds very promising indeed (we adore 2016 as a vintage) but we will have to see if, for all the natural power of 2018, there is enough freshness and energy in the wines to keep them balanced. That balance is what made 2016 such a special vintage, as recent in-bottle tastings have re-affirmed. We did get a very brief look at some 2018s a week or two ago at the ‘Grande Circle’ tasting in London. This was mostly a Right Bank affair and, while it’s impossible to draw any meaningful conclusions from such a small and geographically skewed selection, we encountered wines with no shortage of bold, fleshy fruit, plenty of ripe tannin and high levels of alcohol – as befits a ‘warm’ vintage. There was a lot to like but before we sound the fanfare and declare another ‘vintage of the century!’, it’s worth noting that we did encounter a number of wines with an excessive weight of tannin and alcohol. There just wasn’t quite the balance of 2016. We made no bones about our dismay at much of the 2017 en primeur campaign pricing among the top Châteaux. There were notable exceptions but, given the quality of the wines themselves, the state of sterling, and the pricing of back-vintages, there wasn’t much reason to buy en primeur – particularly if you had bought in 2015 and 2016. We hope 2018 will be different. With a return to normal yields (on average) and négociant warehouses already brimming with Bordeaux, there is certainly cause for reappraisal. Add into the mix the most uncertain political and economic context since the Financial Crisis – in the UK at least – and it’s hard to see how growers could justify pricing the 2018 with the same ‘ambition’ as 2017. Or is it…? Despite the fact that the UK remains the largest single buyer of Bordeaux en primeur, many Bordelais consider Brexit to be ‘a British problem’ and one which should not skew the pricing of a global product. Growers who avoided hail and mildew unscathed are also talking, with worrying smugness, about another ‘truly great’ vintage rivalling (and we’ve heard plenty of grand comparisons) 2009, 2010, 2015 or 2016. If growers think the quality is at those levels, we expect the price of the top wines to be higher than 2017. How much higher is anyone’s guess, but we would be surprised if releases are below 2016 levels and not at all surprised if some are 5-10% higher than 2016. Whatever happens to pricing of the top wines, we can be absolutely sure there will be bargains among the petits châteaux. We’ve said it before and we’ll say it again – in good Bordeaux vintages these properties offer some of the best value in the world of wine. There will be rich pickings among our ‘Fill your cellar for under £250 a dozen’ list. We’ll be posting some initial thoughts on our blog during the primeur tastings next week and look out for some action shots on instagram and twitter if that’s your thing. Given the natural variability of this vintage, tuning into our email bulletins during the campaign will be more important than ever. Make sure your have the ‘Primeur Updates – Bordeaux’ email preference enabled on your account. You can double-check online or email us and we’ll update it directly.